In my job I work closely with a team in India - really just as an extension of our local team in Australia. We talk daily, catch up socially (via e-mail / phone) and celebrate milestones and birthdays. On my birthday last year, the team sent me a Happy Birthday e-mail saying they'd pour a "Blender's Pride" for me over in India. I hadn't heard of it before (being only familiar with the excellent Amrut when it comes to Indian whisky), but shortly after when I pulled together my #101drams list, I knew it had to feature. 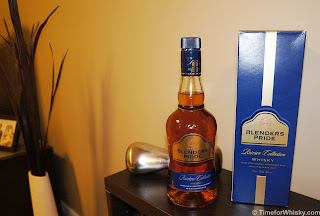 Luckily on a recent trip, one of my team members was kind enough to bring a bottle over - of the "Reserve Collection", which is the premium version of Blender's Pride. Distributed by Pernod Ricard in India, Seagram Blender's Pride is a blend of "imported Scotch malts" and "select Indian grain spirits". No word on which Scottish malts are included. I was warned that I "may not like it" and "it's not as good as Amrut" (which I fully expected, ha), but regardless, I was keen to give it a go. Nose: Light, but with strong esthers. Very fruity - peaches, cherries. Not overly smooth. Palate: Nothing like the nose at all. Quite smooth, and none of the fruit that the nose gave off. The grain influence is there, and it's clearly young. Shortbread, rice cakes, but overall very light on the palate. It's not bad, there's just not a whole lot going on. Finish: Extremely short - mostly gone after a few seconds. A grain-influenced finish with hints of rice cakes at the end. Rating (on my very non-scientific scale): 80/100. Look, I didn't expect this to be a knockout, but I'll be honest and say it is better than I expected. As far as cheaper blends go (it sells for around $15AUD/bottle), it's very drinkable and I'd say would give JW Red a run for its money. Then again, Steph tried it without knowing what it was, and her only comment was "There's no pride in that!!" SCOTCHS and Islay ones are expensive mate..
My friend brought me back a bottle from Nepal and it was far better than the mid range whiskey we have here. Wish it was available in qld. Best whisky I have ever tried. This is a Black label clone. Expert tasters aside, if you do a blind test the reserve collection imitates Black label. It does not imitate double black which is a smoke peaty version of blended liquor. It's smooth , But lacks taste. Royal Stag Barrel select is having lotsl of notes. But don't know caramel/flavors are added or not cause it's sweet on first sip and with soda. But we can surely smell rose abd surprisingly no hangover from both of above.